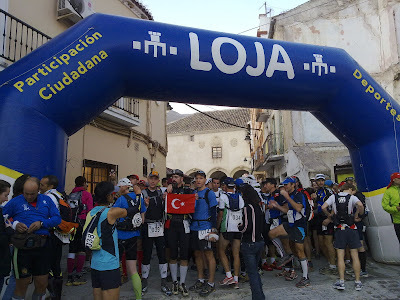 It all started in July 2011 when one of my good friends, Cecile Lavigne, ran the Al Andalus multi-day ultramarathon in Loja, Spain. After running 230K in 5 days and being the 4th woman, she told me great things about the location and the people who organize the race. I have to say I wasn’t a fan of multi-day races at that time. I told her that my goal one day, maybe in a couple of years, was to run a single day 100 mile race. Then in August, when I was checking the Al Andalus website, I came across the Ultima Frontera 160 race. 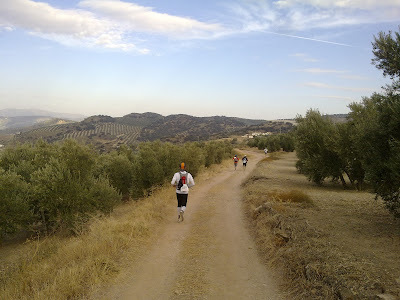 This race was organized in October by the same people who organize Al Andalus and that got my attention quickly. I have to thank Cecile for inspiring me and making me aware of this race. I looked at the travel and accommodation options which seemed nice. 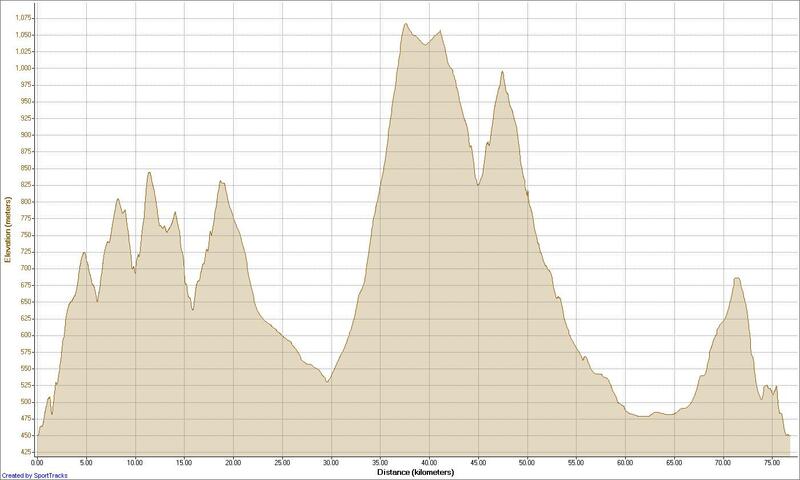 There were three distances available: 50K, 50M(80K) and 100M(160K) which was the 80K loop done twice. I especially liked the fact that there was an 80K option which I thought would suit me well as my longest run to date was 57K. 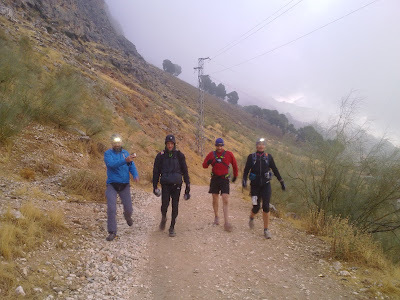 The elevation gain was not extreme but still very challenging with about 2000 meters (6500 feet) on one lap of 80K. But I still didn’t pull the trigger and forgot about the race for some time. 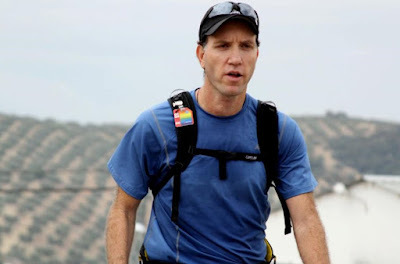 Then one day I was listening to the 100 mile ultrarunning podcast which was and still is my favorite. I heard a quote from Sir Edmund Hillary, the man who first climbed the Mount Everest. That quote really got me thinking. I respect the distance and I definitely believe that 50M is not something to take lightly. But on the other hand, I knew I had run 50K or more 6 times to that date and even though I wasn’t “completely confident”, I was quite confident that I could finish an 80K unless I really blew up. For some reason, I wasn’t sure if it would be that satisfying even if I finished the 80K. But how about running 100 miles on the mountains of Spain for 25-30 hours straight? Running through the night, dealing with sleep deprivation, stomach issues, hallucinations and who knows what else. There were so many unknowns in that distance and I wanted to see which ones I would overcome and which ones I would struggle. In retrospect, I can now see that my decision was to run the 160K just from the beginning but I just couldn’t justify it to myself. It was an intimidating distance and with my longest ever run being 57K, I had every kind of doubt imaginable. After finally signing up for the 160K in September, I began training for the race. I was training really well for the last 5-6 months but I had absolutely zero experience on running in the dark. And the distance that I ran with a backpack in my 27 months running career was a total of 14K. For the remainder of my training I ran with a 3kg+ (6lb) backpack for 90% of all my training runs. I wanted to get used to it as much as I can. I also ran in the dark once in the forest for about 1 hours but it was with two friends. So I have to say it wasn’t much of a training. 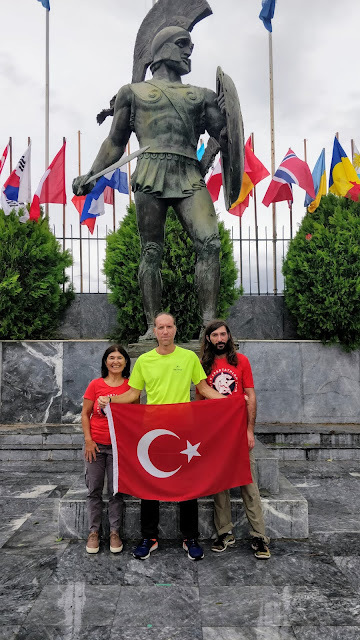 One week after I announced my signing up for the race, two friends, Ilgaz and Caner, told me they too have signed up for the 80K and that they were coming to Spain. That was a very pleasant surprise for me. I was going to travel to Spain before my two friends so I arrived at the Malaga airport on Wednesday afternoon. One of the race organizers, Eric Maroldo, picked me up from the airport. He’s really one of the coolest and nicest guys you’ll ever meet and he gave me lots of last minute information about the race and made me feel at home real quick. On the evening of the race, I woke up at 3:30am to the sounds of sirens at the hotel. I thought it was either police or firemen. It went on for about 20 minutes. I never got out of the bed and could not sleep very well after. But I got a good night’s sleep the night before so I wasn’t very concerned. Me, Ilgaz and Caner a.k.a The Turkish Trio. My plan was to start running together with my two friends who were doing one lap and see how I’d feel. I’d informed them before the race that if I felt as if I was exhausting myself I would slow down and they should just continue. So the race starts at 9:22am and the three of us go at a very smart pace. We are power walking the climbs and running the flats and descents. Sometimes I’m running alongside them but sometimes I am deliberately running about 30-40 meters ahead of them so that I can concentrate on the trails, markings and turns that I would be encountering one more time, this time in the dark and alone. I know from experience that if you run in a group setting you just don’t concentrate on these little things and in this race I was sure that they would come back to bite me in the second lap if I didn’t pay attention. The first 4.5K of the race is mostly uphill. That means quite a bit of fast walking for me in this section. After that it’s sections of ups and downs. The first 19-20K (12M) goes by pretty much uneventful. We enjoy ourselves and try to get a feel for the course. After ascending to the village of Ventorros de San Jose we reach Checkpoint 1 in about 2:26. This is pretty much what we have predicted before the race. We refill our bottles and bladders, eat a few things and continue to the next section. 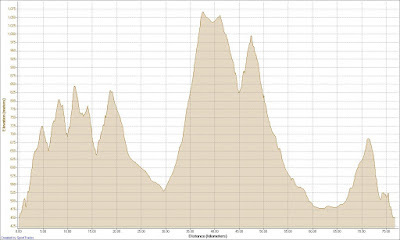 The next 10K is mostly downhill which means some continuous running. We take advantage of that without pushing too much. At this section I notice two points where you can easily make a wrong turn in the second lap when you will be tired and sleepy. I’m saving my Garmin 305 for the second lap because of battery concerns so I ask the distance to my friends at these points and take mental notes. Somewhere around 30K we leave the road and start the 5 mile climb to the town of Montefrio. After going up for some time we see a car on the side of the road. There are three people around the car and it seems like they are one of the runner’s crew. 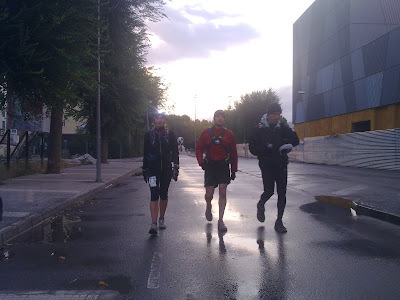 But in true ultrarunning spirit they not only help their own runner but also the others around. A girl kindly offers me and my friends some mashed potatoes which really feels like the best ones we ever had in our lives. 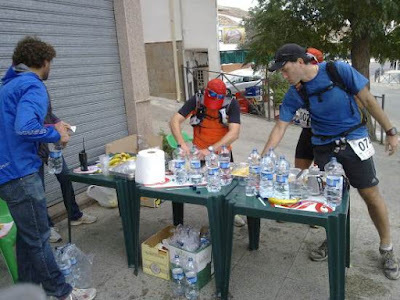 We thank them for the carbo boost and reach CP2 which is in the middle of nowhere and has only water to offer. After getting our chips scanned and having a quick refill we continue to the steeper sections. The weather is pretty cool and it looks like it can start raining anytime. I was told that it hasn’t rained in here since May which was 5-6 months ago. I checked the weather until I arrive to Loja and found out that it was still very hot during the day time reaching 34 degrees Celsius in late afternoon but cooling very quickly once the sun goes down to the point of 7-8 degrees Celsius. Not long after, the rain starts. First it looks like nothing serious but after a few minutes we have to put on our rain jackets to avoid getting soaked. The final miles of the climb seems to go on forever and since we’re continuously using the same muscles over and over again it gets painful. Finally we go over the top and see the town of Montefrio located in a valley on our left. We descend into the town and reach Hotel Enrea which serves as CP3. This is the 48K (30M) point on the course where we can have access to our dropbags. I replace my wet shirt with a new one and put on some more anti-chaffing stuff. Now it’s eating time. It’s been almost 6 hours and I was fueling mainly with gels, bananas, mandarins, cakes etc. Now I need some real food and down a sandwich I prepared before the race. I also eat lots of potato chips and drink a bottle of Gatorade. I take a few pieces of cheese from my friends and offer them some M&M’s. Finally, I also drink an Ensure Plus and I’m ready to go. Before coming to this CP we decided that we should leave in 10 minutes or so, 15 at most. It sounded good on paper but the first time I look at my watch I see that 13 minutes has passed and I’m not even anywhere close to leaving. It’s amazing how fast the time goes by when you get a break from running. After 23 minutes I’m almost done and ask my friends if they’re ready to go. They seem to need a little bit more time and I don’t want to push them so I tell them I’m going slowly and that they should catch me later. My plan is to finish one lap and start the other before it gets dark. I feel it’s important to keep my spirits high. The next section is quite long and I have about 19K (11M) to go in order to reach CP4 which is at the 67K (41.5M) point. The first few miles are somewhat technical as you go through the forest in singletrack paths. There are also a few points where you go very close to a 100 foot drop on the right side. I say to myself that I would have to be careful when running here in the second lap which will be in the middle of the night. I move pretty quickly in this section and see Eric alongside the road with his car. He asks me if I need water and I take some. He motivates me and I continue. Eric tells me that it’s the 57K point on the course which matches my longest run to date. Now I’m in unknown territory. 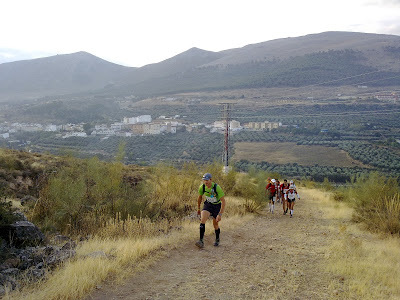 I run with a steady pace for the remainder of the section but have some navigation troubles when I notice some people tore down the marking arrows in the town of Huetor Tajar. I also get one of my feet wet when crossing a stream. I eat some potato chips and mandarins in CP4 and head out for the next and final section which would complete the 50M loop. After going about a mile on the pavement, there’s a 3 mile climb on trails. I walk as fast as I can on this climb and see two guys in the distance. They are walking this uphill section pretty fast so I try to follow them as much as I can. When we reach a flat section I run for some time and pass them. I don’t want to start the second lap in the dark so I try to push a bit harder in the last few miles. Then I reach a very muddy and steep downhill section with lots of slippery stones around. I have to walk it as my shoes get really heavy from the mud and I don’t want to sprain an ankle. After some struggle I’m now back on solid ground and have about 2 miles to go to complete the first lap. 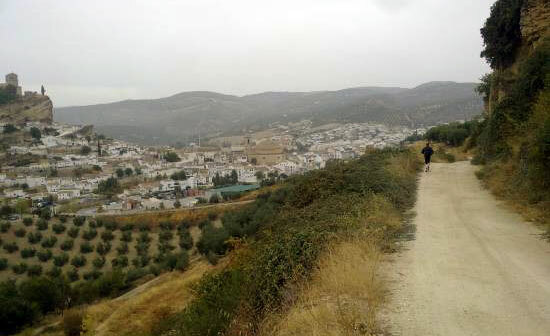 By this time I notice a Spanish runner behind me and I wave him to come join me in this last bit. He doesn’t speak English and I don’t speak Spanish. So with some hand gestures I ask him whether he’s running one lap or two. He says two and asks me the same question. I say I’m going for two, too and we start laughing. It’s as if we are about to start another lap on a 400 meter track. An absurd moment but it really lifts my spirit. Nice to see that I’m not the only one who is crazy enough to start a second lap which would totally be in night time. In the last 100 meters I shake his hand and wish him good luck. We both finish the loop feeling good. I’m still feeling strong and happy that I’ve come this far but I know that the real struggle starts now. I eat some stuff, change my socks, put on a dry shirt and long sleeve and put another one in my bag as I know it will get very cold at midnight when we will be approaching Montefrio. After taking a beanie and gloves I head out. I still have about 10 minutes before it gets totally dark so I achieve my goal of starting the second lap before dark. I see another Spanish runner behind me and ask him if he wants to join me in the first few miles of the second lap. But he’s eating a sandwich and walking quite slow so I go alone. After going for 15 minutes it gets completely dark and I spot two headlamps in the distance. I catch them in a few minutes and notice that they are the same two guys I passed at the end of the first lap. This time I slow down and talk to them. I learn that they’re from Ireland and tell them I’m from Istanbul. They seem to go a bit slowly for my taste and my plan is to cover some ground when my brain and body are strong so even though I want to go with them for some time I know I should take off and do so. 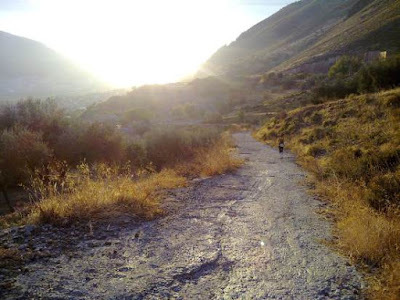 After about 10 minutes, I’m power walking a long climb and notice a headlamp coming closer really fast behind me. He catches me quite quickly and I see that it’s one of the Irish guys. He says his friend has been having problems for so many hours and he’s considering dropping out so he had to leave. I learn that his name is Aidan and he’s from Dublin. We talk about some other things but not about running together. He’s actually running maybe a bit faster than I would have liked in the first few minutes but I don’t say anything and just try to keep up. After about 10 minutes the pace is a bit slower but still great after running for almost 11 hours so I feel really good that I have someone to run with at my own pace. We hit the 90K (56M) point going really strong. I tell him my longest run to date was just a 57K and ask his. Aidan tells me he ran 257 laps on a 400 meter track in 11 hours which is 103K. I know how mentally strong you should be to run that many laps on a small loop so I’m thinking to myself it’d be better if I stick to this guy for some time! He also tells me there’s a weird pain at the back of his right leg since mile 10 or so. It doesn’t affect him when going uphill but he struggles on descents. I offer him going slower on downhills and push more on uphills which he thinks is great. He also lets me know he has a crew following him from checkpoint to checkpoint. I immediately think of the people who gave us that great mashed potatoes in the first lap and ask if they were his crew. He says yes and I tell him I should thank them again when I see them at the next CP. We reach the next CP which is at the 100K point and it starts to get really cold. I put on the second long sleeve shirt on top of the other one I’m wearing. Aidan also gets a beanie, gloves and a long sleeve from his crew. I remember coming to this CP at 2:26 in the first lap. This time we are here at about 2:49 which is great considering the fatigue of running 10+ hours, going in the dark and that we had to stop at a few locations to be sure we are going in the right direction. We make some good time between 100-110K which is mostly downhill but we try to keep a close eye on Aidan’s right leg and not push it too much. I tell him we might have a chance to break 24 hours if we can keep up. He says it’s too early and he’ll be just happy to finish. He’s definitely right. 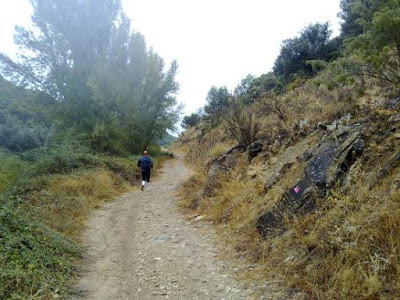 My thinking is that I want to have an achievable goal in front of us because if not I fear we might lose our focus at some point and that means we might be wandering on the trails like zombies for 30+ hours. We agree to go strong as much as we can and consider it again when we reach the final hours. We have a few scares around this time when we fail to see marking signs for quite some time. We never get lost but these scares make us more focused about the markings. We tell each other to keep our eyes peeled. Aidan is also very happy with my Ledlenser headlight since his light seems to be not very strong, My headlight really lights up the trail even on its middle strength. After some time I look at my Garmin and see that we have reached 103K and congratulate Aidan and tell that this has now became his longest run, too. I hope that it boosts his confidence and takes his mind from his leg for a bit. Approaching the 110K (70M) mark something really weird happens. I’m carrying two handheld bottles with gloves on my hands. At some point I look at my hands and my left glove is missing! I’m totally shocked. How can this be possible? I stop for a second and go back to look at the road for 30 seconds but there’s no glove around. Still have no idea how this happened. I don’t want to spend time with this thing so I turn back quickly. I tell Aidan that some really weird things happen when you run for 15 hours/110K straight. He tells me that when we meet his crew at the 128K CP they can give me spare gloves which sounds great. After a few minutes we start the 5 mile climb to Montefrio which means “Cold Mountain” in Spanish. We leave the remote CP at 113.5K mark and I start to have weird things going in my stomach. After some time I tell Aidan that I need to go for number 2. He keeps walking as I relieve myself. I immediately feel much better. But after 10 minutes I need to go again. And one more time after 5 minutes. I then have to admit to myself and to Aidan that I’m having a bad case of diarrhea. I think it’s the cold weather, the sweat that dries on me, and the cold water I have to drink that upsets my stomach. He says he has Imodium tablets and they should work in a few minutes. He tells me to take three at once which I do. I start feeling much better in 5 minutes and almost back to normal in 20 minutes. I thank him for saving my life and we are back to business. I know I have to replace the lost fluids but the water is extremely cold and I don’t want to upset my stomach again so I take small gulps, try to make it warm in my mouth and then swallow. When we get near the top Aidan’s leg starts to bother him again and we take quick stretching breaks. It’s really amazing that he still keeps on pushing with this leg after having pain for so much time. We both know one of the cardinal rules in ultrarunning, no matter what the pace is we should keep on moving. After finishing the climb we see the lights of Montefrio on our left. Aidan asks me the time, I tell him it’s almost 1am. He tells me some of his friends should be in Dublin pubs at this hour of the Saturday night and we say what better way to spend a Saturday night other than running on the Spanish mountains! It’s really nice to be with a positive person and still get a good laugh after running for almost 15 hours. During this time I see a glowing marking sign on a tree at the distance. But there’s something weird about it. It swings slowly from one side to another. It’s really spooky and I get a chill through my spine. I feel like I’m losing my mind and start hallucinating. I don’t tell Aidan anything because I don’t want him to think the guy he’s running with is delirious. We came closer and closer and I notice that it was tied to a branch and it swings because of the wind. I look at Aidan and see that he’s looking at the sign, too. I ask him if he thought of the same thing and he tells me he was about to go crazy and that he doesn’t know what he would do if he were alone. We see a few more of them later on but they don’t have the same effect since by then we know what’s going on. I feel like a strong bond is created between us in a small amount of time and we really become a great duo. Approaching the Montefrio CP I tell him if he ever comes to Istanbul he’ll be my special guest. He promises the same thing about Dublin but he adds that he also promises me to never run 100 miles with me again when I came to Dublin. He says we’ll do other things. Well, I hate to break it to you like this Aidan but if I ever do another 100 miler and I get to choose who I run it with, you’re at the top of my list! So we reach the 128K (80M) CP and we have a chance to eat some pasta here. I eat a plate quite slowly because I can’t swallow it quickly. I then put off my wet shirts and replace them with dry ones. Got a few snacks with me and meet with Aidan who’s with his crew. And now I feel like they are my crew, too. They give me new gloves and they give Aidan three more Imodium tablets just in case I have trouble again. 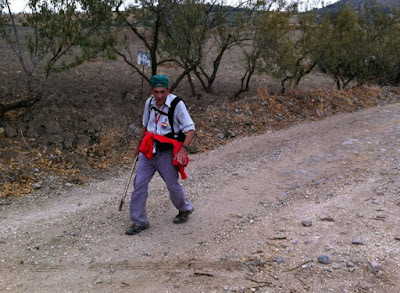 One of Aidan’s friends decides to pace us until the next CP which is at 147K (92M). As soon as we start running I’m having weird feelings in my stomach again, so this time I tell Aidan I need those tablets right away and have three of them at once. I feel much better after taking them and we head out to the technical trail section. We are still moving pretty quickly. Since my headlamp is better I take the lead and try to set a good pace. As we finish this section pretty quickly we see a headlight behind us. It’s Christine from Iceland. I thought we were going really fast but she must have been running extremely well. We talk for a little while and then she tells that she wants to come with us but she needs to go because she’s the second woman and don’t want to lose her place. We motivate and wish her good luck and off she goes. Her courage motivates us too and we start to run for some more. After about 25 minutes we see another headlight behind. It’s closing in really fast. This must be a strong runner especially at this point of the race. When it comes closer we see that it’s Christine again! She says she got lost not long after leaving us and struggled to find the right way. She’s really an amazingly tough woman. She says she’s tired of getting lost and that she wants to come with us. We say we’re more than happy to have her with us. About this time the rain starts again, it lasts for about 10-15 minutes but comes down really hard. We get our feet wet in the same stream crossing again and finally reach CP4. Aidan’s friend leaves us as we thank him for pacing us. 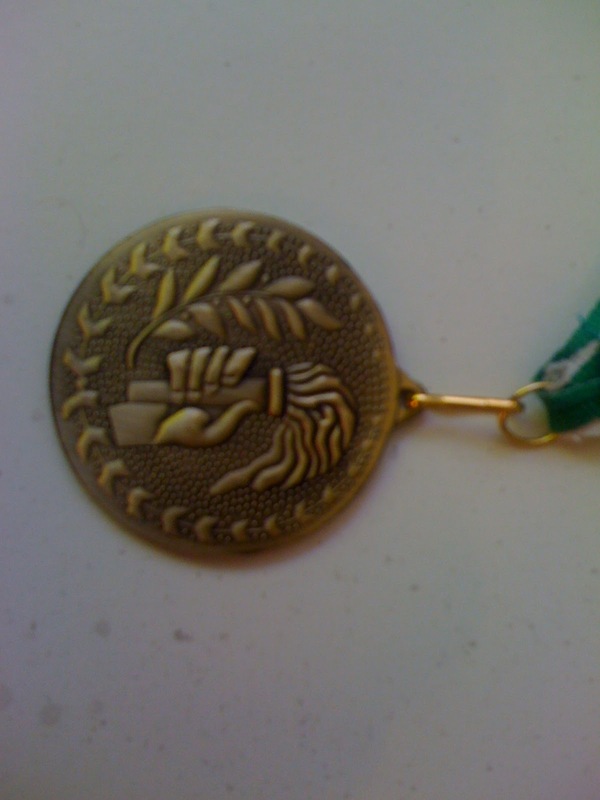 I told him before that they, as a crew, should get a medal, too. I meant that because they were up more than 26 hours following him (and me) around the course. Thank you guys, you were absolutely outstanding! So, we now have 13K (8M) to go to the finish line. After the flat section we start the last climb that would last for about 3 miles. At this point the rain starts again and Christine gets very cold. We take out her emergency blanket and wrap her up as she continues walking fast and asks me if we could still make it sub 24 hours. I make some calculations and tell her that we can definitely do that as long as we keep on walking fast. The last bits of the climb really seems to go on forever as I tell Aidan and Christine I’m happy that they’re with me otherwise this would have been too much of a struggle going alone. They say they feel the same way, too. We reach the very muddy and slippery downhill section again and agree that this is no time to make a stupid mistake. So we go down the trail as slow as a snail. When I make it to the bottom I wait and congratulate both of them as they come beside me. Now all we have to do is walk for 2.5 miles and we’re done! After 100 miles... If shoes could talk! They ask me if we can still make it before 24 hours and I’m confident that we can. We have more than an hour to spare. It’s getting light at this time and we see a runner behind approaching us. We inform Christine since currently she should be the second woman in the race. She definitely has the strength to run but she says she came with us all this way and she wants to finish it with us. This will be the first 100 mile finish for all three of us so it’s quite special. Three people pass us in the last couple of miles but we don’t care. We congratulate them and keep on walking, joking and enjoying the last bits. Aidan says we should do a lap of honor. Christine says it would be nice to do that as there’s a 400 meter track at the finish line. But after spending almost 13 hours with Aidan I get his sense of humor quite well. I turn to Christine and tell her that he’s talking about doing another lap of 80K! We laugh so hard it almost hurts more than my legs. Then I look up further down the trail and notice familiar people. It’s my friends who did the 80K. They tell me that they got up early, came to the finish line and learned that I had passed the last CP so they were waiting for me to come. I thank them as they take some pictures and video. I know that having these guys with me in most of the first lap was very important for me. When we see the finish line I shake hands with both Aidan and Christine and we congratulate each other. 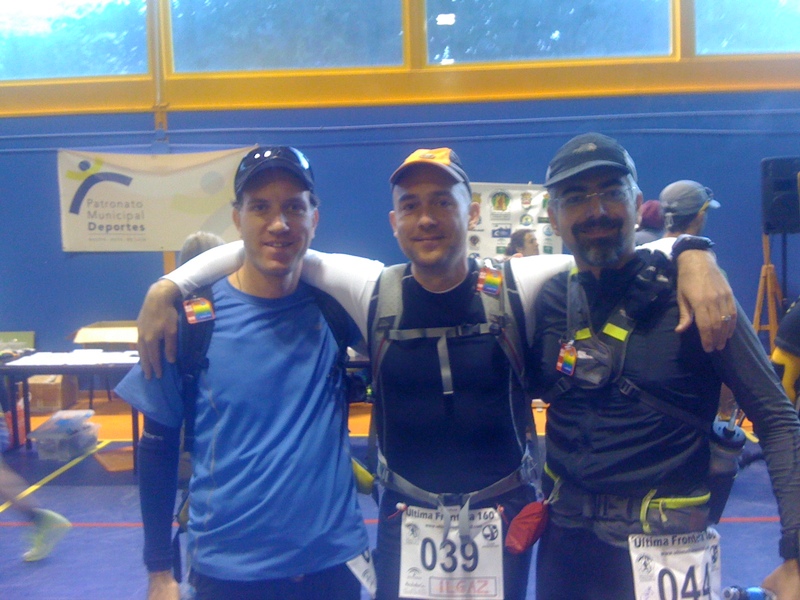 The three of us are about to finish our first 100 milers together. We run the last 200 meters and finish together at 23 hours and 28 minutes. A very special moment that I’ll remember forever. I see Aidan’s crew waiting there. I hug and thank them for their great support. 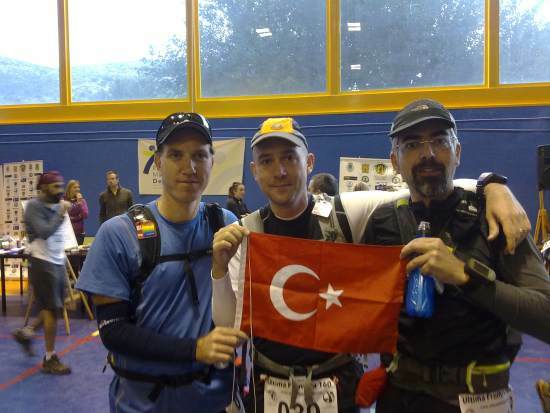 I also thank my friends Ilgaz and Caner who supported me in the first lap. Aidan and I ran the second lap together and it was a tremendous help. We were lucky to have Christine in the final stretch with us because she's not only a great runner but also a great person. Thank you guys, I never thought my first 100 miler would be fun but you guys made it happen. Christine, Aidan and me/ Just after crossing the finish line. Overall, this has been a great experience for me. I not only completed my first 100 miler but also got to meet with great people. One of the highlights of the race was running on the same course with Mr. Francisco Contreras Padilla. At age 73, running with his street clothes and shoes on, carrying his stick and finishing 100 miles in 28 hours 48 minutes… It’s something you really had to see to believe it. He’s a true inspiration for all of us. Francisco Contreras Padilla at age 73. He doesn't even need running gear! Photo by Jorge Moreno. I want to thank Barbara, Michelle, Eric, Paul and all the other people who worked hard for this event. Also congratulations to all competitors who had the courage to start. Hope to see you guys again. Kalemine sağlık amigo. Strong running with a crowning post. Looking forward to run again together!